Patrick Norguet is a very distinctive french Freelance Product Designer that’s known over a few years for his fourniture and interior design, he has worked with renowned brands like: Renault (Brusels and Tokio), Marithe & Francois Girbaud (Florence, Paris and Peijing), Petit Bateau, among others. 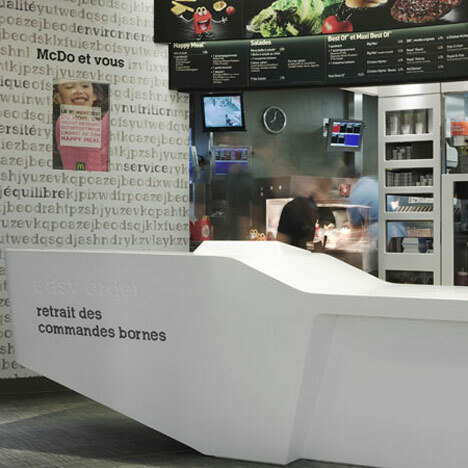 This is the time for the fast-food grand Mc Donald’s across France, where Norguet was in charge of executing the new Identity Interiors for the restaurant. The idea was to return to the concept of “Family” which in the passed years was being returned to, leaving behind the “teenage hangout”. 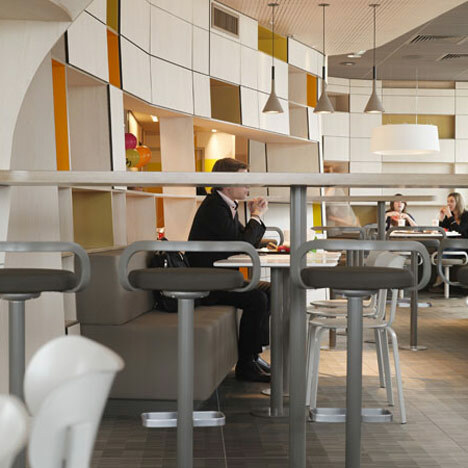 We can see how the design has notably changed, in terms of furniture and even colours, we’re not in the playgroud for kids anymore. 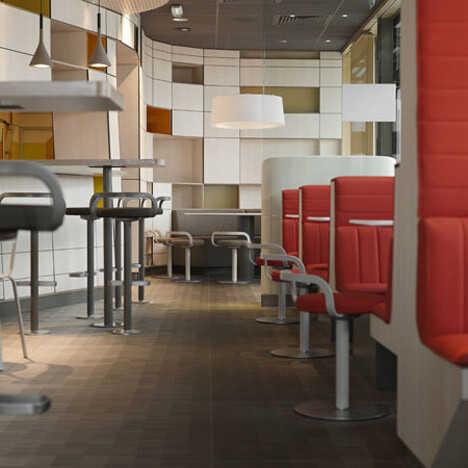 The designer based on a neutral White pallet with degradations of grey and light brown, but always including the active and bright colours that caracterize Mc Donald’s, like yellow, red and a little orange was also added this time. 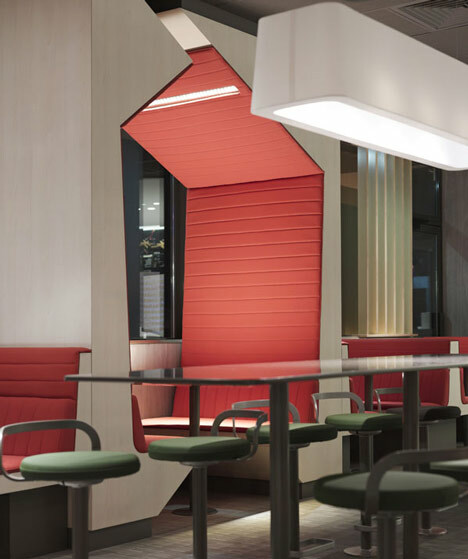 Norguet created diferent spaces and with those, different moods for the social interactions, open areas for eating standing up as well as more private areas for gathering in family, and digital terminals where you can order and have the food served directly to the table. 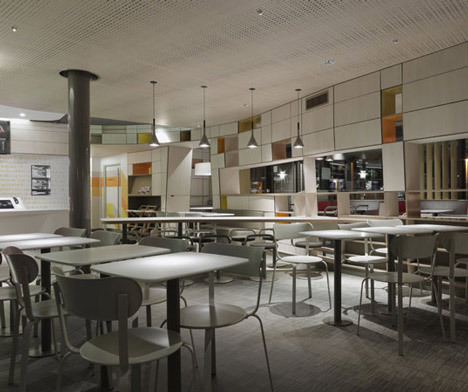 The zones are divided with his own “Still” metal chairs from Lapalma, plywood cabinets, shelving and booth, a very organic and also functional furniture wich is a very important topic in the fast-food restaurants. 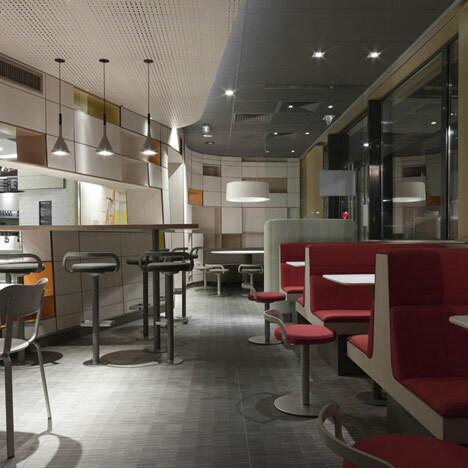 The colour palette is the important topic in this design, the main idea is to return to the “Family Resaurant”concept and besides the new and formal interior design the colour is one of the most important factores when we want to direct and space to an specific client. So the great tip in this design is that the colour can define a space if you direct it correctly, even if you have the simplest room, just think about what you want and who you want to visit your new areas. 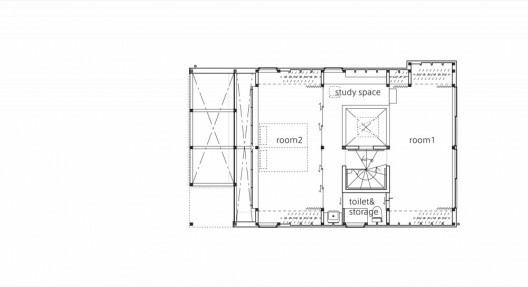 This is a very interesting house in terms of Functional Space. This residential house with 108,11 m2 takes place in Tokyo, Japan, in a pice of ground open from North to South that gives the amplitude and openness that caracterized it. A place created with the main idea of “organization” so the owners had plenty space for storage and disposition for their personals. The storages are located on the two walls with more lenght (East and West), that define the edge of the ground and are closed to the exterior. 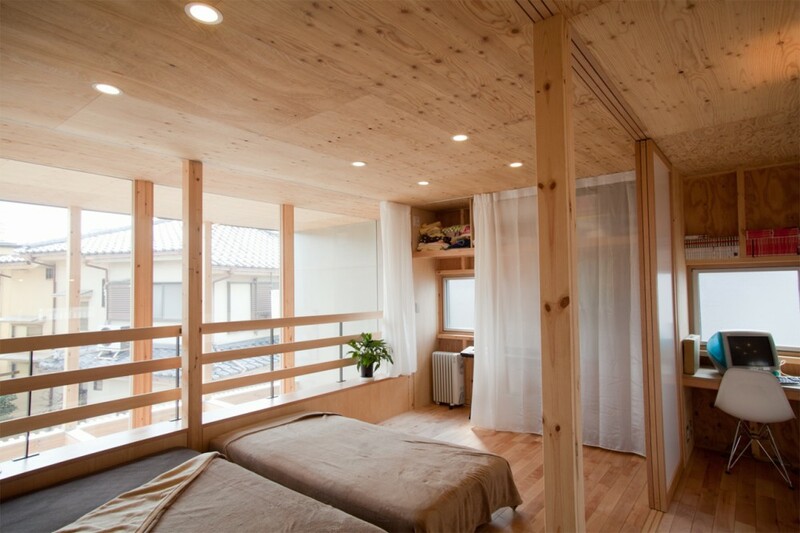 The structural walls were nominated “Futokoro” wich in japanese means: “hollow space between something”. 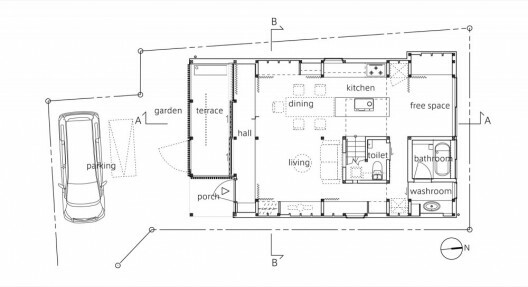 Between those two walls takes place the kitchen area, the dinning, the living room and a few free spaces more on the ground floor so the owners can personalized them and still follow the open concept of the design. 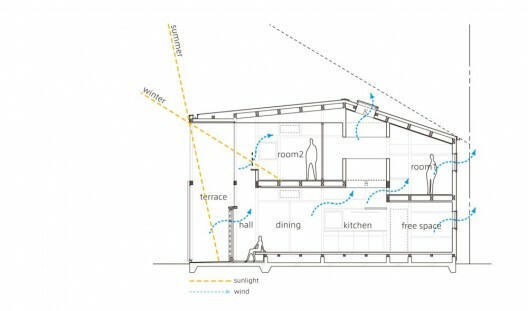 They also focus the design on having natural light and ventilation, that is achieved beacause of a skylight in the centre of the house and a numerous cuts on the exterior walls as much as in the interior walls so the air can circulate all around the diferent areas of the house. 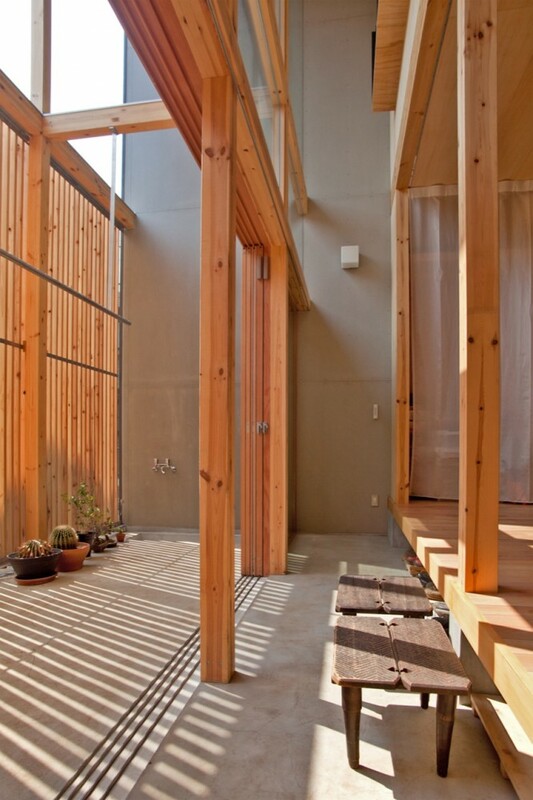 The front of the house is covered in wooden lattice that gives the owners privacy but at the same time allow the entrance of sun light into the house. A great idea for those who have a limited and space; There are always list of solutions for intrincated grounds. 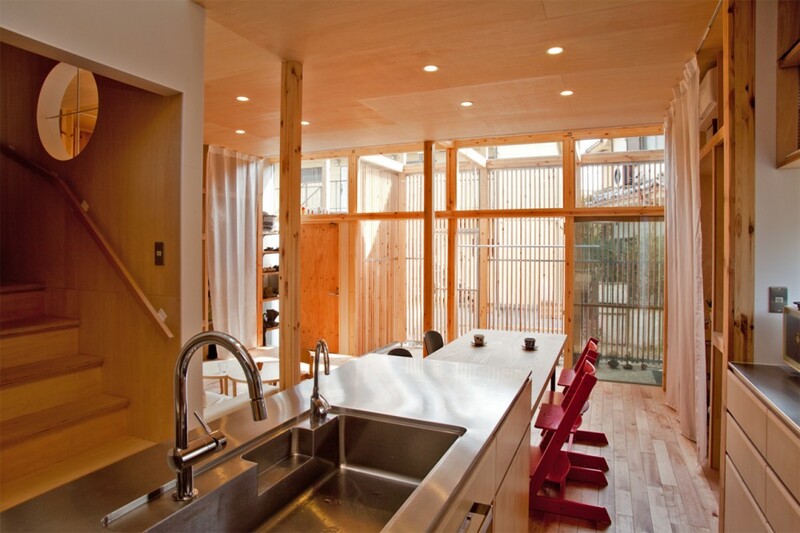 In this case, they had the answer for the organization theme, creating storages on the sides of the main circulation of the house, this detail leaves and open and bigger space for circulation. 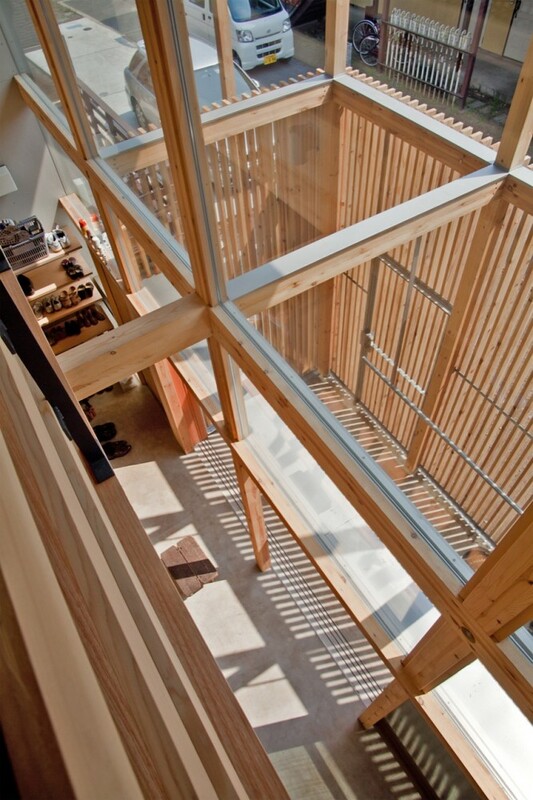 The illumination has also been solved among the entire house with a skylight and a complete open front that brings natural light on the two levels of the house. 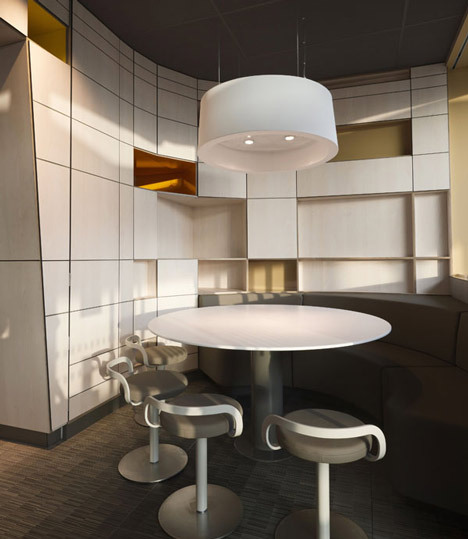 These concepts are easily adaptable for our designs or home modifications.